I fondly remember my first visit to Marlesford. Despite the proximity of the awful A12, a beautiful narrow lane carried me down from Hacheston, across a ford, and into this lovely village. You just wouldn't have know that the busy road was there. St Andrew is up a lane, splendid in its greenness on this spring day. The fields around were verdant too, horses kicking their heels in restlessness at the unfamiliar sunshine. Birdsong filled the graveyard, and I felt good to be alive, good to be here. On another occasion, a couple of years later, I came here late on a chilly September afternoon. 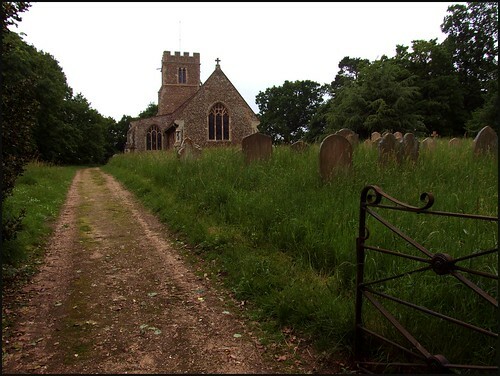 A smell of woodsmoke blended with the rising dampness of the graveyard, a feel of Suffolk beginning to prepare itself for winter. It is simply one of the loveliest little villages in East Suffolk. But I hadn't been to Marlesford for years, and as I cycled around the maze of lanes I couldn't find the church, just for a moment: and there it was, at the crest of a rich velvet cushion of uncut grass. The heat and rain of spring 2008 had conspired to make the countryside as richly green as I had ever known it. This is a small church, with a pretty south aisle but no clerestory. The renewed sanctus bell turret on the nave gable is probably identical to what was there before; there's one similar across Suffolk at Worlington. There's a lovely image niche on the porch. As with most churches in this area, St Andrew is open every day. I stepped into an interior that I remembered perfectly, that lovely combination of a medieval space and an enticingly rustic 19th century restoration. The best feature of the church is its collection of Ward & Hughes windows, depicting the children coming to Christ on the north side, and Mary Magdalene meeting Christ in the garden on the south. The south aisle has its own little sanctuary, with modern wrought iron rails enclosing the sweetest little altar. The Alstons gaze rather severely from their 17th century memorial, while further west is a later memorial to Lemuel Shuldham, who at the age of 21 was killed in the Battle of Waterloo: Far in advance, within the right of the French lines, his body was found the next morning and buried on the spot. Above the inscription is a cornucopia of the paraphernalia of battle: a cannon, a banner, a cornet, and so on. But the memorial is not wholly secular, because the inscription goes on to say that the memorial was erected to preserve in his native village a record of one so early and nobly lost... in the blessed hope again to behold himin the beauty of immortal life. Marlesford is probably most famous for being the home village of Flora Sandes. She was born in Yorkshire in 1876, but her father moved to Marlesford to be Rector here when she was nine. She spent almost the next thirty years living in this little backwater, where she seems to have made quite an impact, being notorious for tearing around the local lanes in a French racing car which she had taught herself to drive. On the outbreak of World War One she joined the St John's Ambulance Brigade, and set sail with a group of other nurses to the Balkans. However, she became separated from them behind Serbian lines. For safety, she joined a Serbian regiment, and was soon promoted to the rank of Corporal. Shortly after her 40th birthday, she was seriously injured in a grenade attack, but recovered to reach the rank of Sergeant-Major and to be awarded the King George Star, the Serbian equivalent of the Victoria Cross. She retired from the Serbian Army in 1922 to run a hospital. At the start of World War Two she was interned by the invading Nazis, but then expelled, and she returned to Suffolk to spend the rest of her life. She undertook lecture tours in her Serbian Army uniform, and eventually died at the age of 80. A small brass plaque in the chancel remembers her here, but her life is best known for being the subject of the book and film The Lovely Sergeant. It is the quite extraordinary tale of a remarkable woman.